Baubles are one of the Christmas ornaments that can’t be forgotten when it comes to our household Christmas decorations. These baubles are typical decorative ornaments that can take part in the Christmas trees ornaments, that can go in doors or windows, that can be used to decorate our chimney or even in centerpieces. That’s why we’ve decided baubles should be the main ornaments this Christmas 2019. 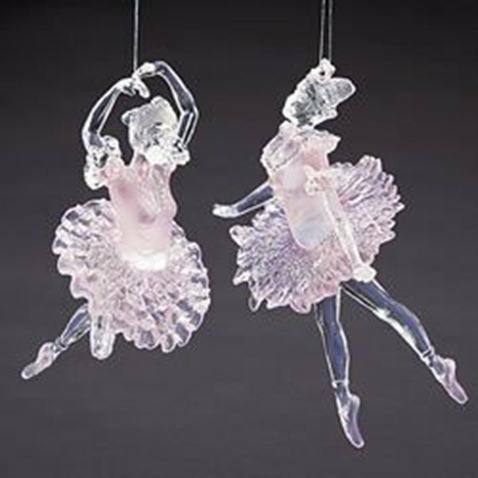 We will give you some ideas and suggestions on how to decorate your house with these ornaments. Do not miss out on our updated baubles photos for Christmas 2019. 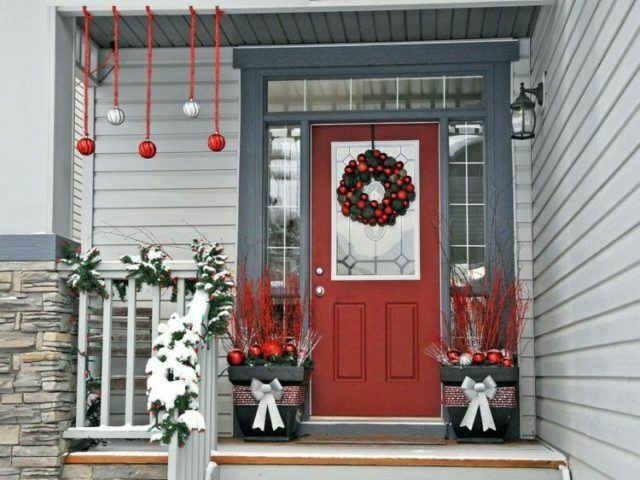 Christmas baubles are one of those decorative elements that you can’t forget during this time of the year. 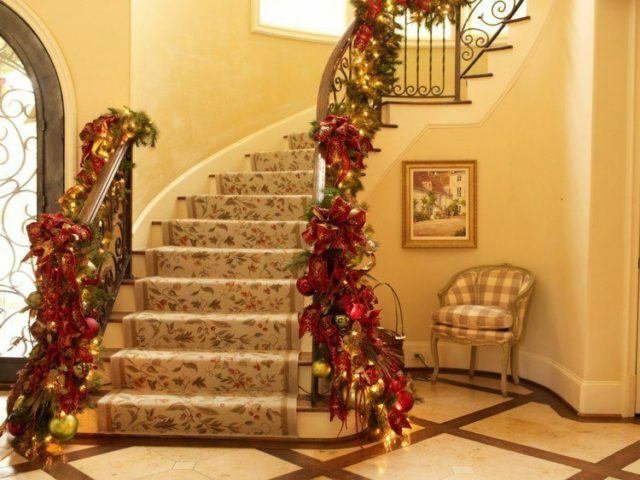 There are ideas that can easily help us arrange the Christmas decorations. 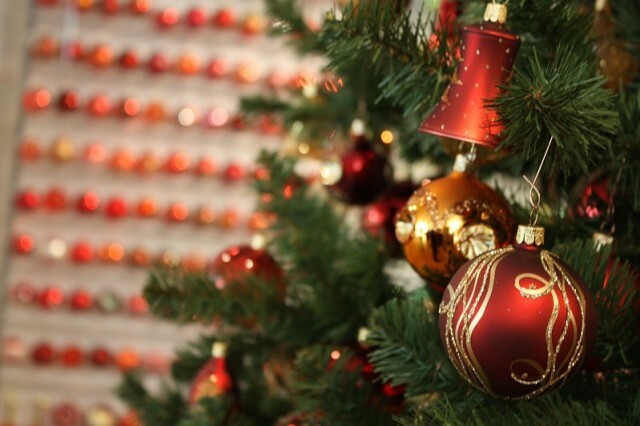 Although if we think of baubles, the first thing that comes to mind is the famous and typical Christmas tree. 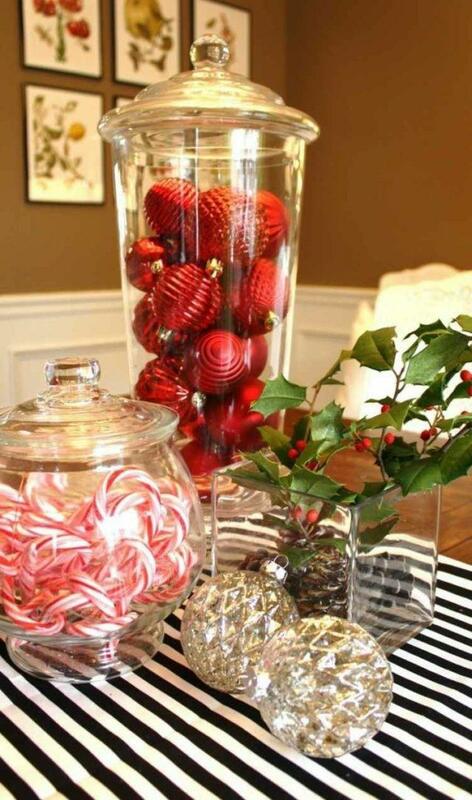 With baubles we can make many other types of decorations such as centerpieces, door decorations for the holidays or other arrangements for other areas of our home. The baubles that we can create can be made out of many different types of materials, giving them different styles and colors to combine better with the Christmas decoration of our home. We can also accompany them with other accessories such as fabrics, lights, ties, or tinsel. With lively colors we can make unique decorations with our baubles. Up next we will see what kind of baubles we can make by ourselves to decorate the house. 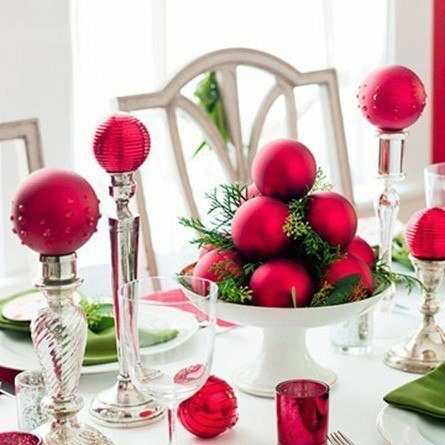 Among them, we will find christmas bauble centerpieces, homemade baubles, see through baubles, decorated christmas baubles, Christmas with thread and many more options you can discover if you keep reading this article. 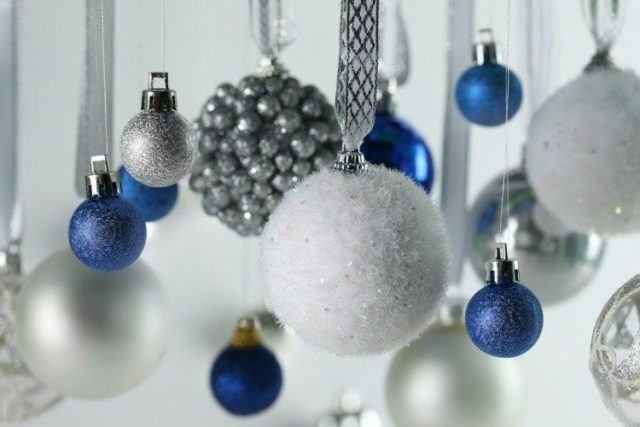 Cloth baubles are very good choice if we want to make a different Christmas ornaments, because they will give a very different touch to the classic Christmas decorations. 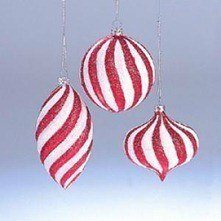 We can choose baubles completely made of cloth or those that carry some decorations in cloth or, for example, those that you can hang of a ribbon. 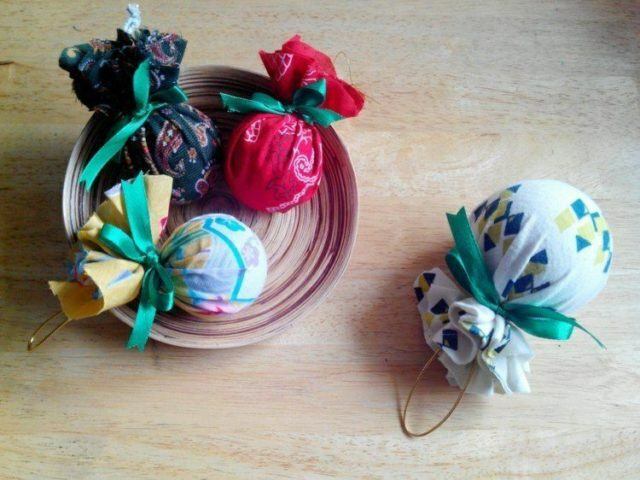 To make baubles of cloth, you only need to choose a fabric (or take a shirt or rag that you no longer use, fill it with paper or rice and close it with a nice Christmas tie). Then, if we want to hang it from the Christmas tree, we have to put a string to be able to tie it to one of the decorated branches. 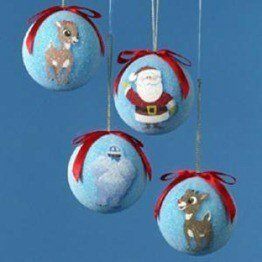 This would be the easiest way to make Christmas baubles with fabric, but if you want to make it more complex, you can also decorate a plain fabric, with trim and decorations in gold or other colors, which can also be appropriate for Christmas. This one we see in the photo, is especially beautiful because the fabric is antelina. 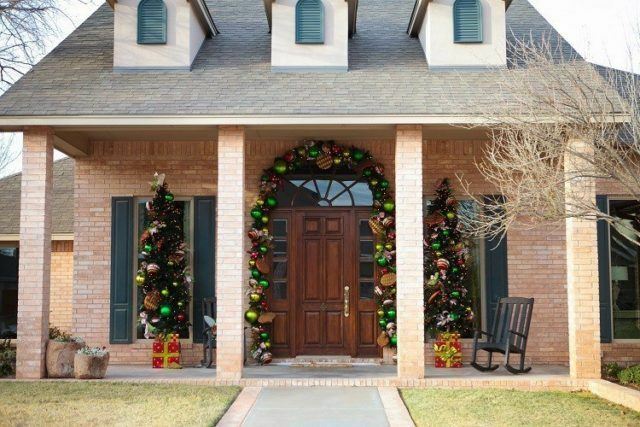 We can use baubles made of cloth to create a Christmas centerpiece or other home decorations, but we can also join several baubles and create a crown and hang it at our door to receive all the guests we have at this time. 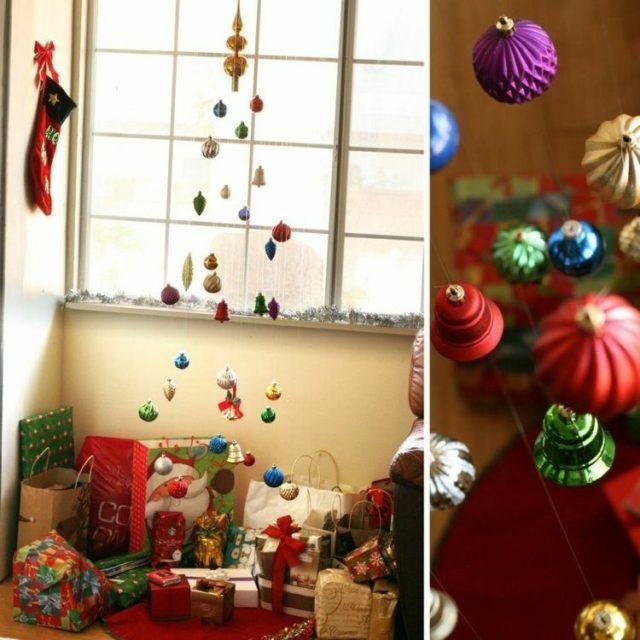 Cloth baubles are perfect for decorating our Christmas tree because they can give you a lot of color and, in addition, if we have made it ourselves, we give it an original and unique touch. To hang them you can get a golden cord or a sturdy thread. This thread or string can be attached to the bow of the bauble or, if it is a bauble of cloth you’ve bought, it surely has a hole in the surface that allows you to pass the string so you can hang it from any branch of the Christmas tree. 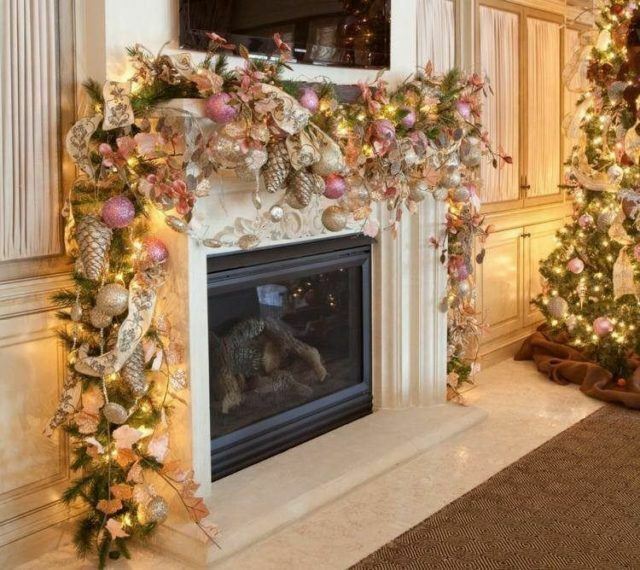 Finally, the fabric of the baubles does not have to be unique, we can also use them in other types of decorations or as a union between the baubles of a centerpiece or a crown. For this season we can find very appropriate fabrics such as satin or all kinds of glitter. 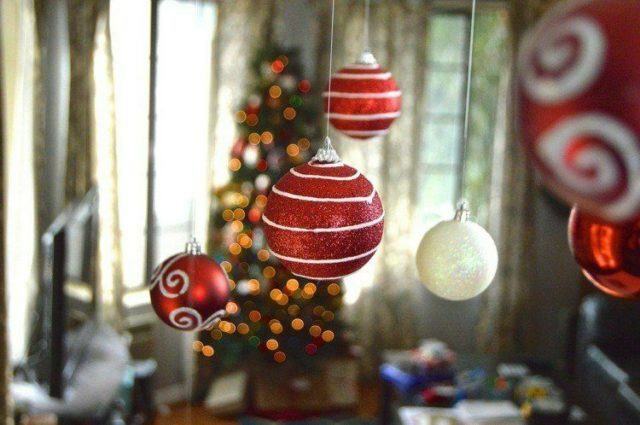 For an authentic Christmas, there is nothing better to do as a family than homemade baubles. Next we will know many different ways to make your own homemade baubles without investing too much money or time. The result will be fantasic! 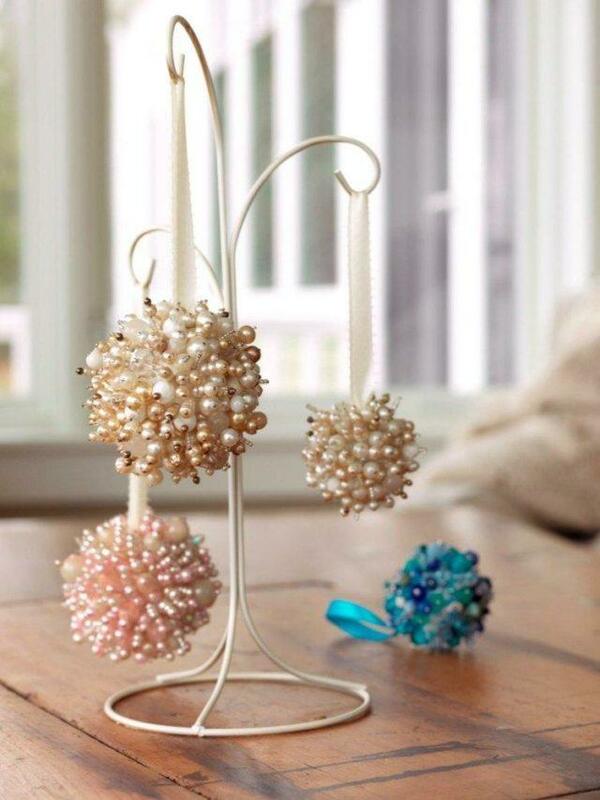 As we see in the picture above, one of the options for making homemade baubles is to make pompoms. For this, you can do it with wool or with any hair fabric. If you decide to do it with a soft fabric, it is best to make a ball of paper and lining it with the fabric and, if you do it with wool, it is the same process but with several laps of wool and cutting the trim to make them look as if the hair was moving, which is typical of pompoms. We can also buy cheap unpainted baubles, that is without any drawings, so we can decorate them to our liking. Buy the paintings that you like and some golden boats because it is sure to be the color that you are going to use. 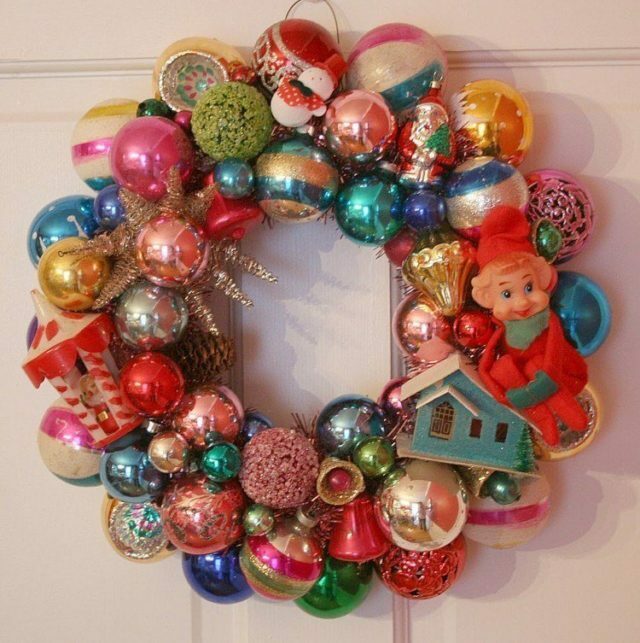 You can also use glitter and Christmas stickers to finish decorating them. 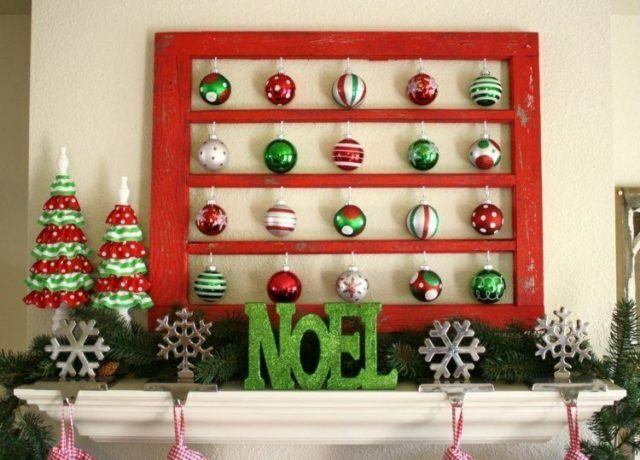 You can even paint everyone’s names so everyone can have their own Christmas bauble! Although this idea is something more complicated and can take us more time, it’ss one of our favorites. 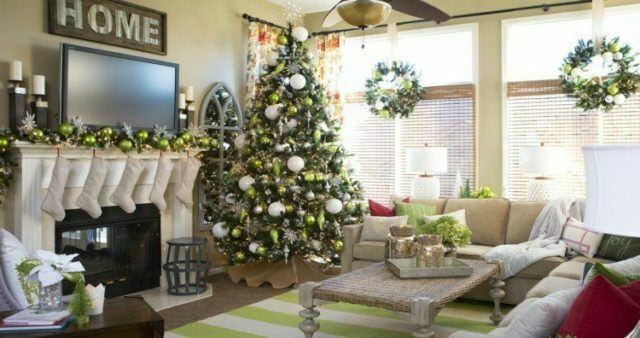 Christmas trees do not stop being trees of the nature so it would be a great idea to decorate it with flowers and other plants. 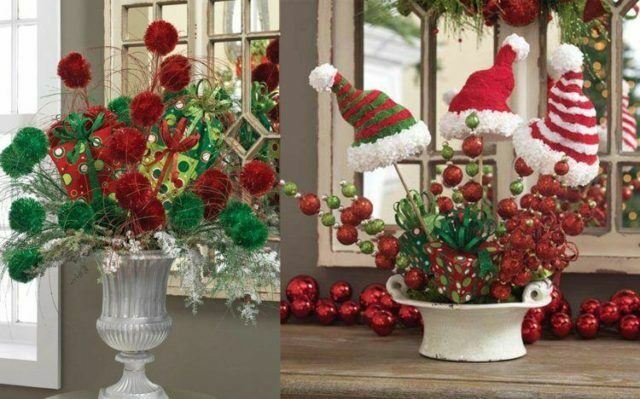 For this, you can put together several bouquets with flowers and petals and put them together in the shape of a Christmas bauble. It will be very natural and very romantic for this holidays. 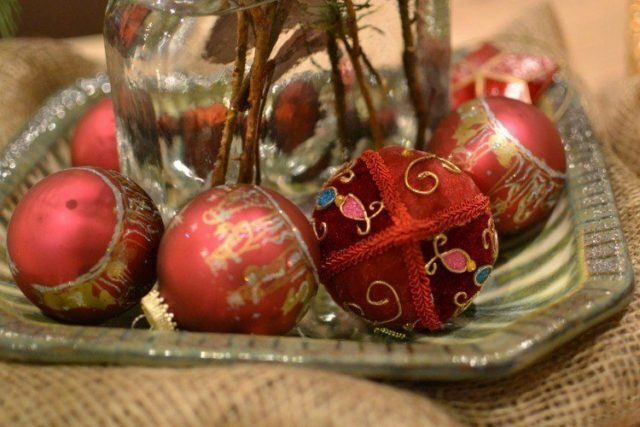 Finally, the good thing about making homemade baubles is that you can make them the color that you like or that best matches the rest of the Christmas decoration of your home. 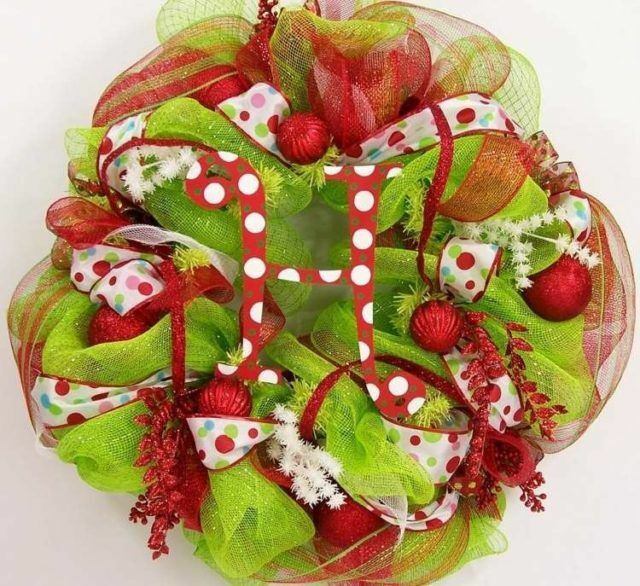 To paint them, if you want to do it faster and don’t go into much detail (for example, for centerpieces or Christmas wreaths for the door) you can use paint spray. Be careful because silver, white and gold tend to sell out these days. Paper baubles are perfect for any Christmas ornaments and will be much cheaper than if we buy them, not to mention all the paper we can recycle for the occasion. 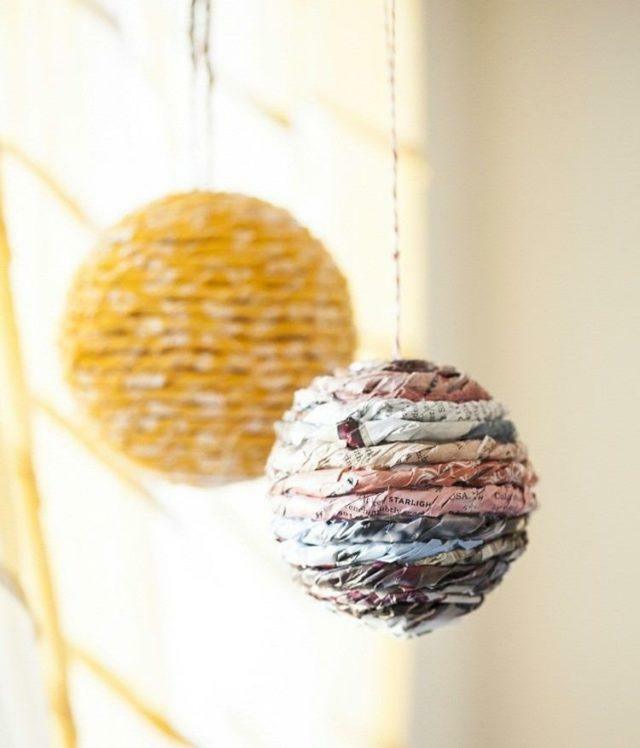 Here are some ideas for making paper baubles. This idea is great for reusing paper that will no longer be useful, such as the role of sheets of old newspapers. First we must make a ball of paper and then cover it with fragments of more newsprint, sticking them one after the other with a little white glue. Then, if we want them to look prettier, we just have to give them a touch of color with some spray that we like. 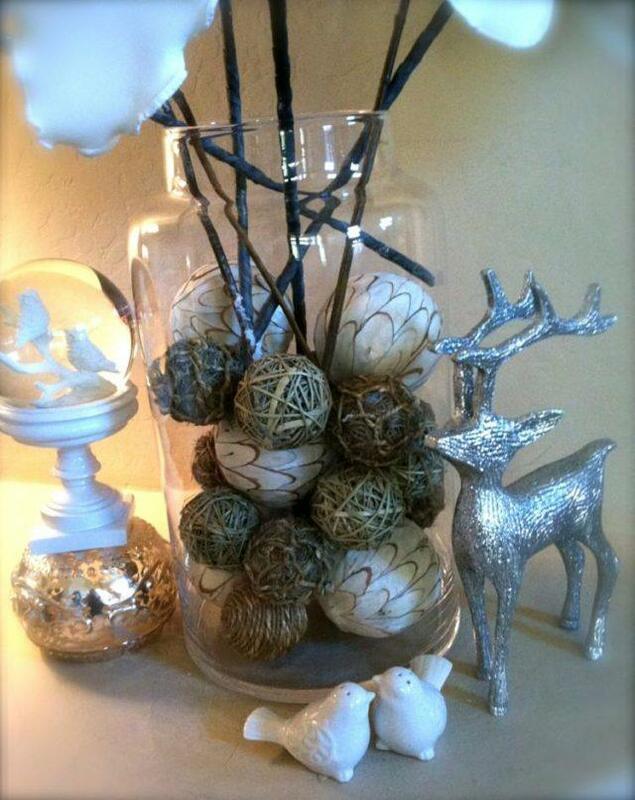 If you have old bulbs that no longer work, do not throw them away because they can also serve as baubles. You can decorate them with colored paper and you can also fill your own paper light bulbs with some foam that will be see through, which will look very pretty hanging from the tree. 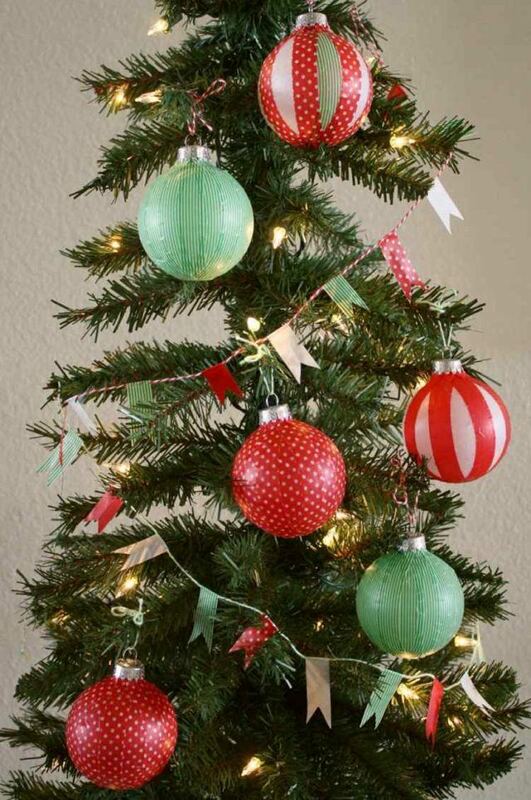 You can also make strips of paper and stick them on a bought bauble to give them a personalized touch. 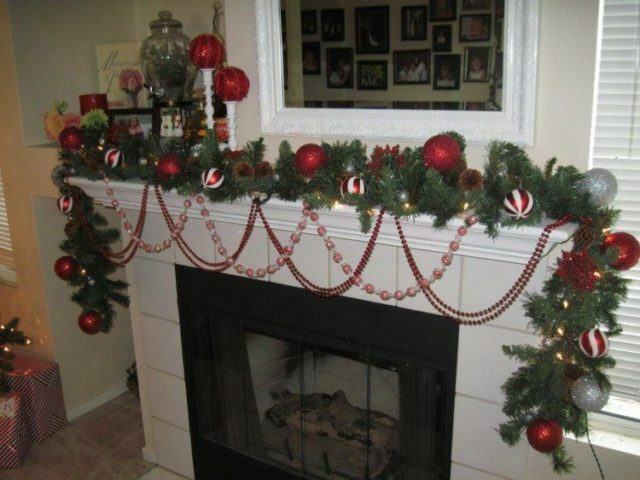 If you’re going to use this idea, you better look for bright or flashy papers to make everything look a lot more Christmasy. 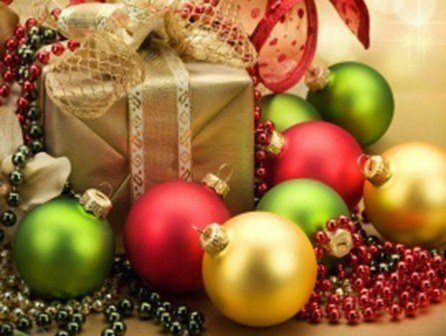 Another idea that you can try this Christmas is to buy baubles of a plain color (without designs) and then to decorate them and paint them as you wish, so you can have personalized baubles that perfectly match the decoration of our home. Keep reading if you want to find which ones are the the best decorated baubles. 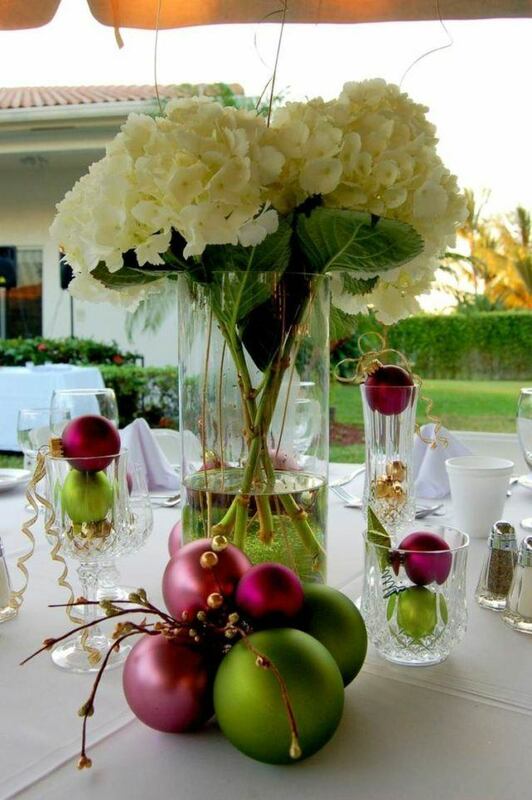 If you want a more sophisticated decoration, you can choose baubles decorated with a plain color, and if you also make them all have the same color, the Christmas decoration will be much more sober and elegant because it will not stand out too much in comparison to the rest of the house. Something to take into account is metallic colors, very fashionable this year for both clothing and decoration. Thus, try to look for a spray that meets this condition, so that the final result is similar to the baubles we see above. 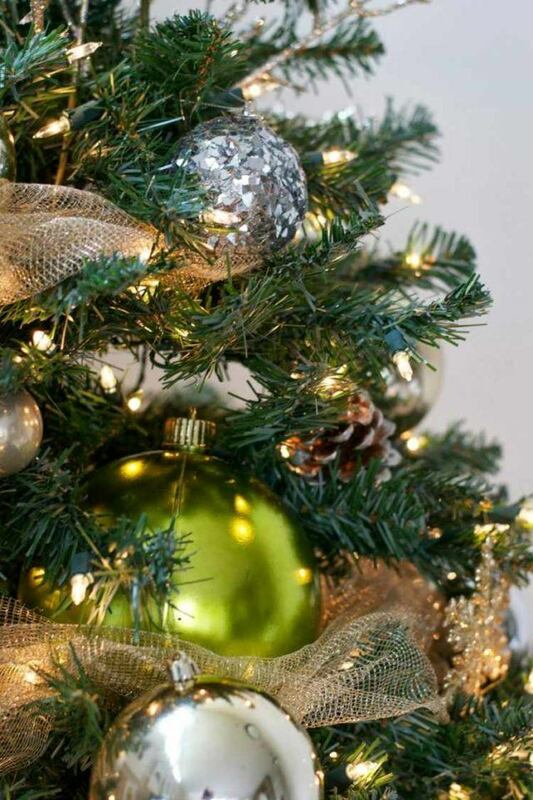 Another element that we can’t forget while decorating your baubles, is the glitter. This decorative accesory makes the colors more vivid and more suited for the typical Christmas decorations, since these sparkles represent perfectly the spirit of celebration. How about we customize our own baubles? So we can have some unique baubles, that no one else can have in your house. Keep reading in order to discover some original ideas for customizing baubles. 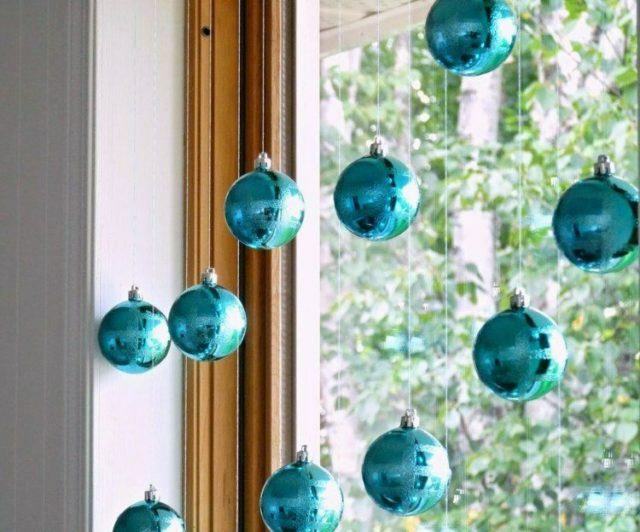 This idea of ​​customizing baubles is perfect for when we want to change the frequent Christmas decoration of our house or the Christmas tree we put each year. 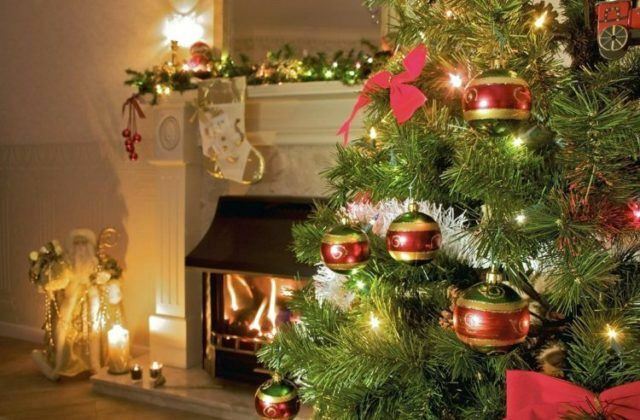 In this way, we will not have to spend as much money to buy new ornaments, to personalize and create a different look for those baubles we already had. As we see in the photos, the glitter and the printed paper are going to be our best allies to personalize the baubles. But you can also look out for other types of materials. For example, lately it is very fashionable to do crafts and DIY with washi tape, colored adhesive tapes and with all types of prints. 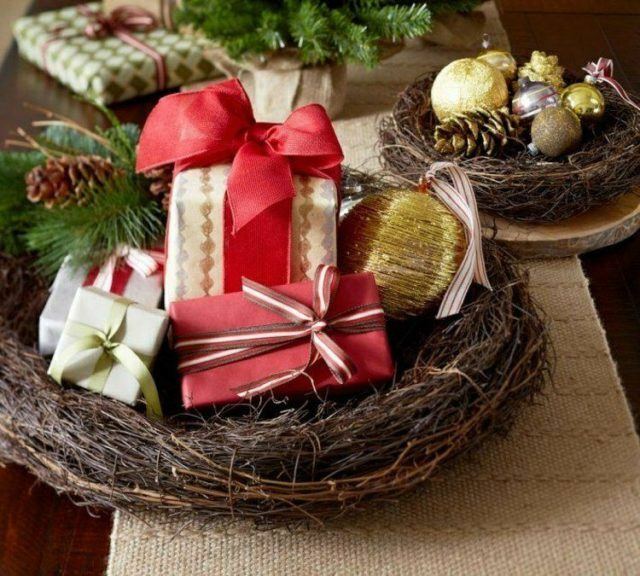 To personalize your baubles, you can buy several Christmas washi tapes and combine them to line the baubles. 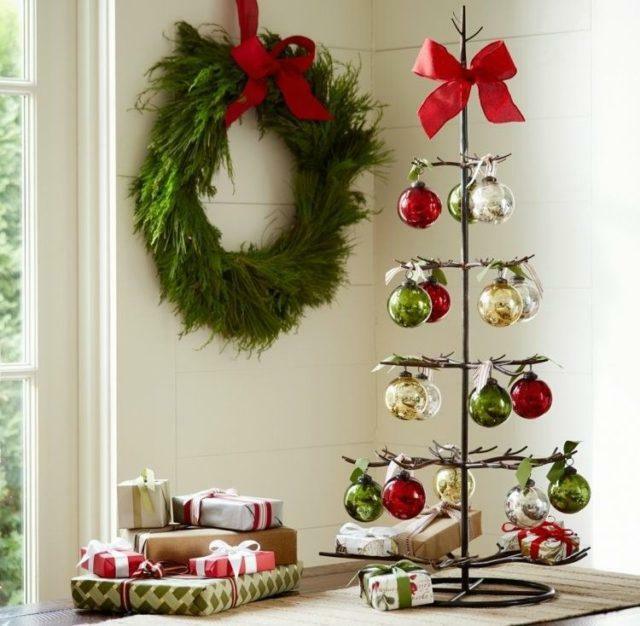 Nor do we have to pass up on the opportunity of buying other Christmas decoration accessories that can also create a different atmosphere and personalize the baubles. You can make them yourself with a little holly and foil and tie several baubles to these elements, with a decorative ribbon. They will be perfect! The foam is also a very important part of the decorating process but also when it comes to customizing baubles. We can stick some of the color that we like to the baubles and look much more elaborate and striking for any type of decoration. With our personalized baubles we can make all types of decorations, either for the living room, the bedroom, the hall, the door or the porch of your house. With the baubles designed by you, some ties and some vases you can create really unique decorations. For instance, we love the following idea. All we need is a vase or a long glass in the shape of a tube and place some personalized baubles of the colors that we like. If we do it in two colors it will be more colorful. 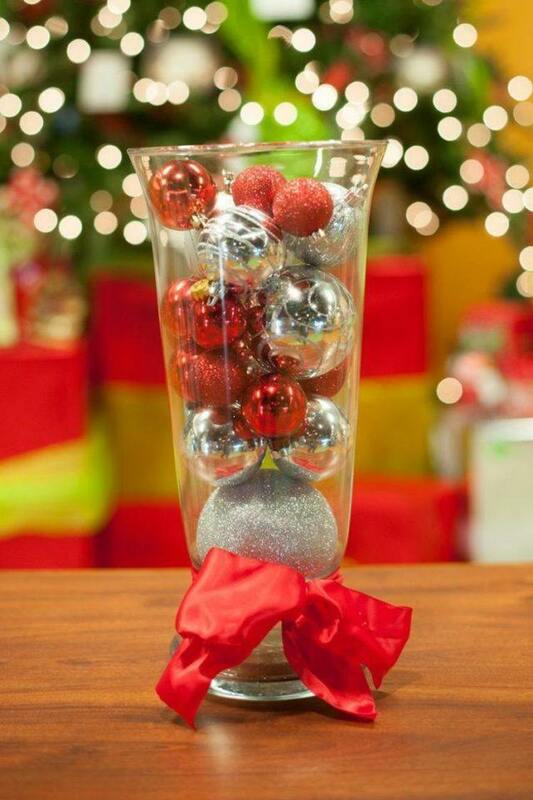 Finally, place a ribbon at the base of the vase and you will have the perfect centerpiece for any Christmas dinner. If you want to make bicolor baubles like the ones that you see above decorating the fireplace, you have more than one way of doing so. One option is to do it with paper. First we paint the ball in one color and then the other. Whe we have already applied the second color, we make cuts with a cutter and let the paper underneath. But you can also do it with paint, placing marks with adhesive tape so that between one color and the other everything is perfect and clean. These personalized baubles are our favorite because they are very original and are also very easy to make. First choose another cloth and fill it with rice and then close it with a few stitches of with thread. Then pick up several needles or pins and insert some beads that can pass through them. Finally, pin the needles or pins in the rice bauble until they give with the touch of the beads. 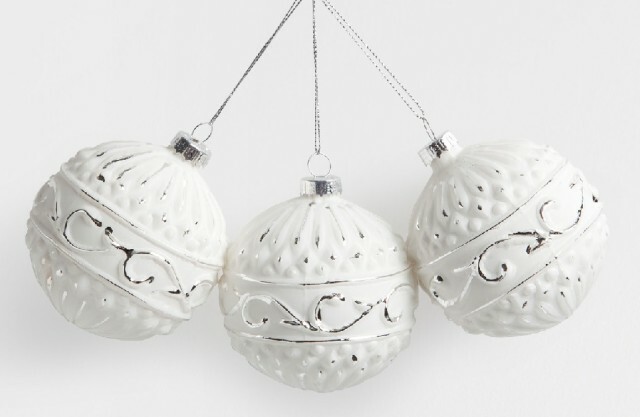 Put these around the bauble and they will look as pretty as these. We must not forget that the baubles that we personalize do not have to have the same shape. We can make some in diamond shapes or as spinning tops, even with a rhombus shape. This way we can make more personalized decorations. This idea is also our favorite. 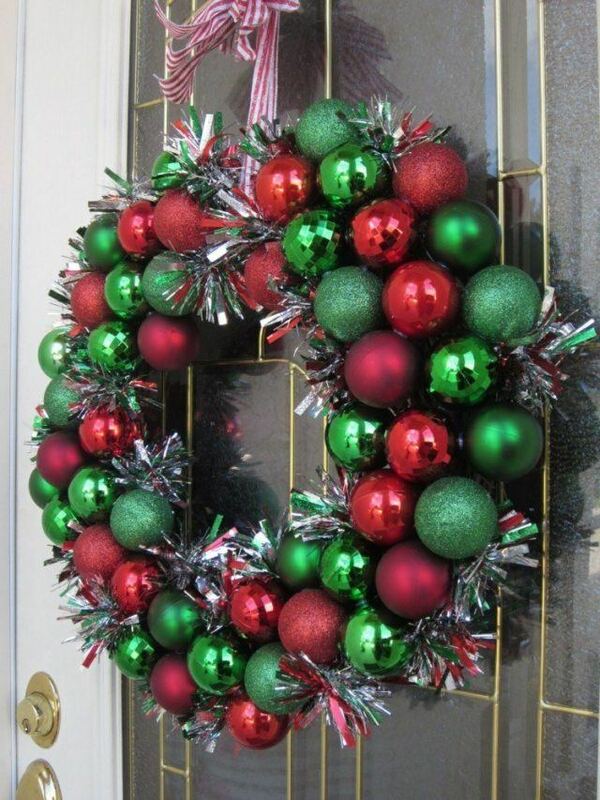 In order to achieve this result you need see through baubles and paint cans to bathe them inside. If you want something even more different, try to do it with balloons although you have to be careful because if they explode you can stain everything. 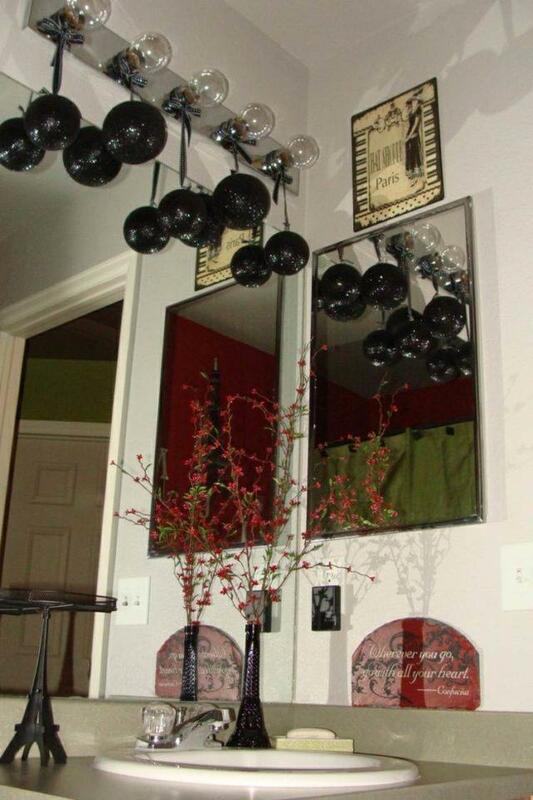 See through baubles are also a widespread trend in recent years. These baubles can be very interesting because we can customize them to our liking. For example, we can bathe them with paint inside or introduce the ribbons and colored foam and they will look amazing. These baubles can be a little bit cheaper than the average baubles and we have the advantage that we can make them as we like and give them the colors that best match the Christmas decoration of our home. 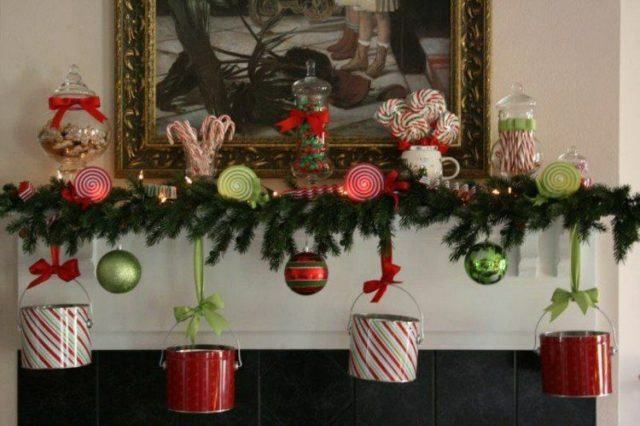 Also you can change them every year of color and thus renew your decorations when you get tired of them having the same colors. 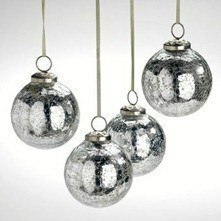 The glass baubles give a much classier and elegant appearance to any Christmas decoration, either being in the Christmas tree or in any area of the house. Here are some ideas and tips regarding crystal baubles. Glass baubles are much more expensive than plastic baubles, but we can also find more beautiful designs, done with care, which have spectacular details. 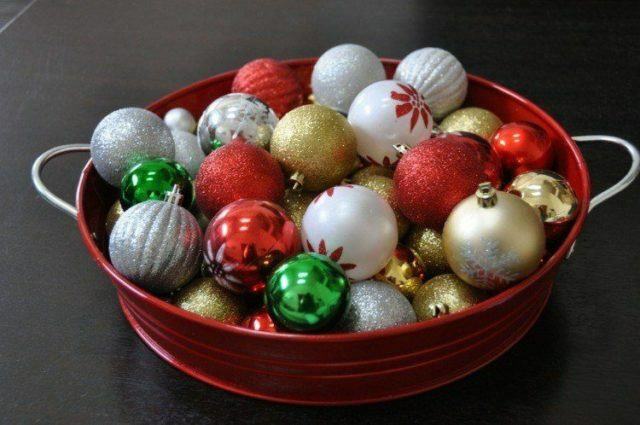 However, if your intention is to change your decorations every year or you tend to get tired fast of the same colors at Christmas, your better option would be to choose plastic baubles. Likewise, if you decide that you want the glass, you can save them and people in your family will be able to pass from generation to generation. 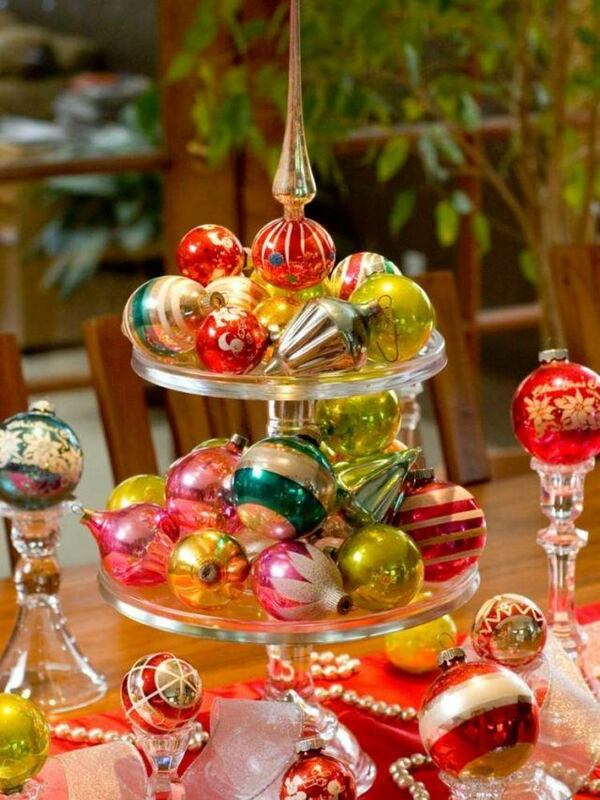 Nevertheless, glass baubles are not recommended if you have children at home, because they are likely to go crazy with them and will definitely want to play with these baubles. Therefore, the baubles might be in danger and can end up falling and breaking. In order to celebrate Christmas with children properly it is better to use plastic baubles. However, if you want to buy glass baubles, you can place them where children won’t reach them and problem solved! Glass baubles are usually more expensive, not only because of the material they are made of, which is more expensive than plastic, also because their designs tend to be more unique and it takes more work to do them. Manufacturers know that a person that buys plastic baubles wants them to last forever, so they try to make really nice designs for the baubles. Not only are there glass baubles, but in stores we can find all kinds of Christmas decorations made of this material. Together, they combine very well. But it all depends on the money you want to spend in Christmas decorations this year. Finally, if you end up deciding to buy glass baubles, we recommend that you keep the baubles between newspaper so that they are more chopped and when you pack them until next year, they won’t crack or break. Baubles with thread are a classic Christmas. With thread we can make all kinds of Christmas decorations, including Christmas baubles. Keep reading this section if you want to make baubles with thread and see the ideas we have gathered for you. The first idea that we suggest is to take a Christmas bauble that you already have, sprinkle some glue in it and roll in a piece of thread. 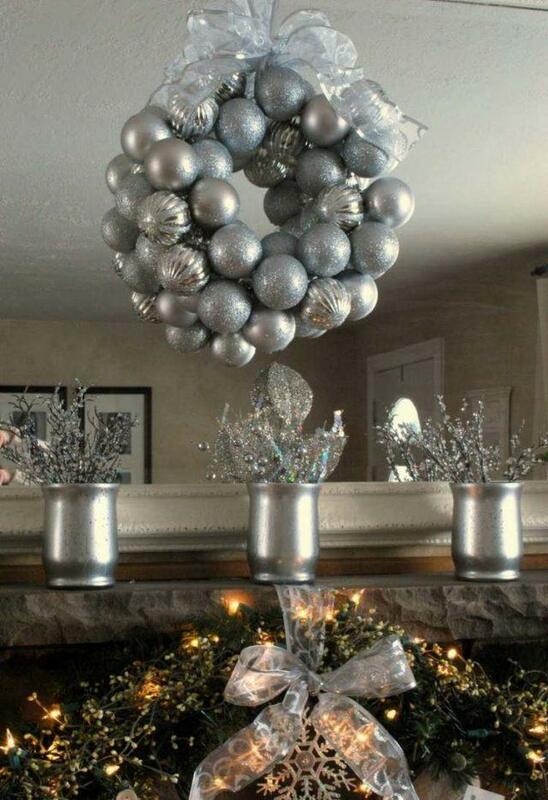 This idea can be very original as it makes our baubles stand out above the rest of decorations. If you prefer it, you can also think of making baubles with bicolour yarn. In order to do so, we need two pieces of thread, one of each color we want (blue and silver can be a very good combination) and do the same process we did when we only had one thread. You can also do it in stripes or any way you like. 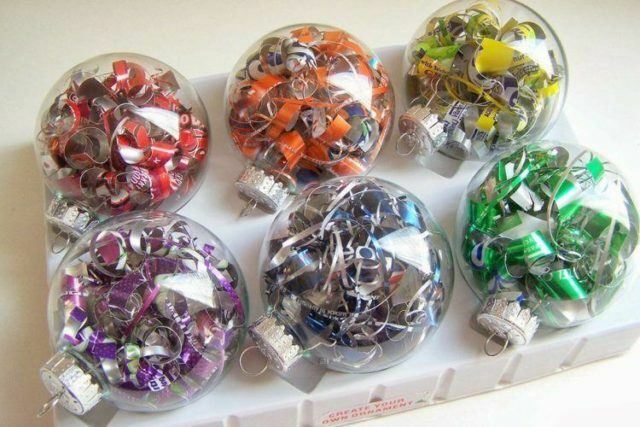 We can also use the thread to make small details or drawings in the baubles. 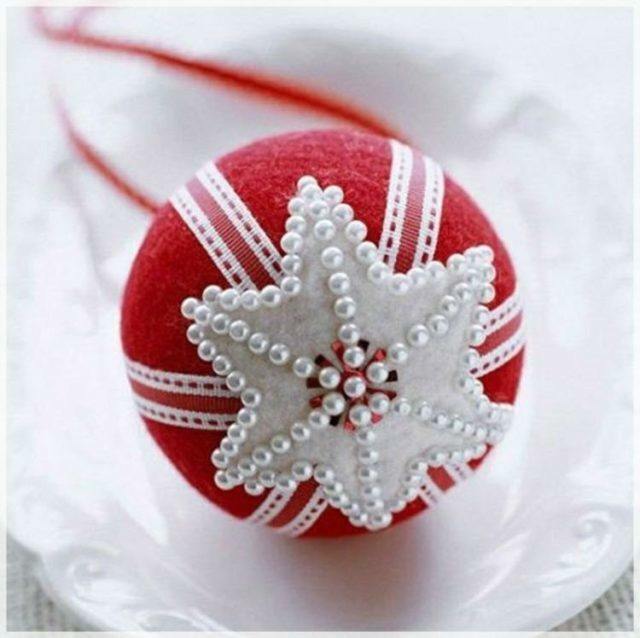 For example, with a little gold thread and glue, you can form a star in the center of a Christmas bauble. Although as always, this depends on your creativity and the drawings you want to make. 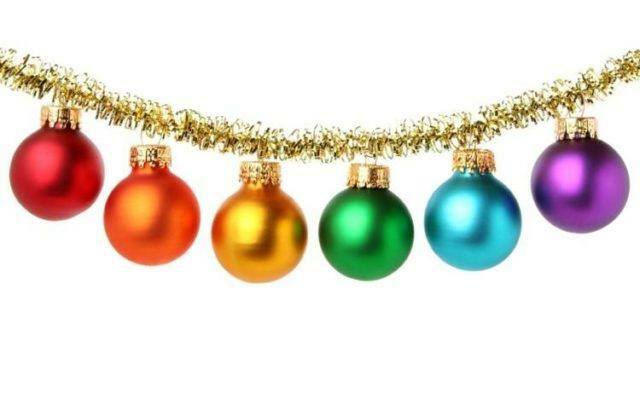 If we have see through baubles, the colored threads can be a perfect idea to fill them with colors or the color that we like. The result is very handcrafted and the guests that come to your house these days will definitely love it. The threads can also be our best allies to make Christmas decorations with more baubles, foam, garlands and other decorative accessories. With the threads we can tie everything in a nice way so that nothing moves but our decoration is not affected. The thread is also very useful, apart from to make baubles with thread, to give some celebration touches to our Christmas tree. Note the following trick: buy golden thread, bathe it in glitter and throw pieces of this thread all over the tree: it will look like serpentine! The thread is also perfect for hanging baubles in the tree. 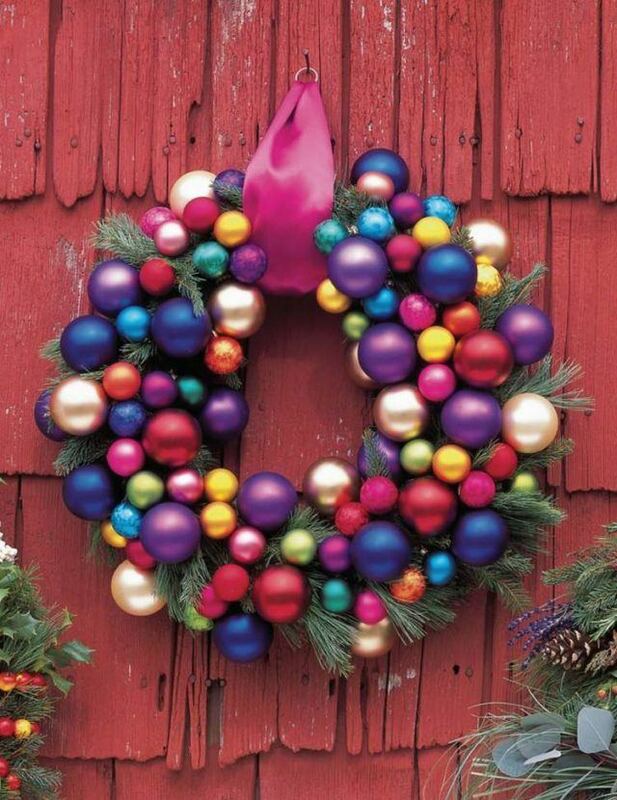 We have to tie it to the circular hoop that all baubles have on top. We cross the hole with the thread and we can hang the Christmas bauble wherever we like. Although we can also make many Christmas decorations for our house with baubles that are not hung on the tree or anywhere. 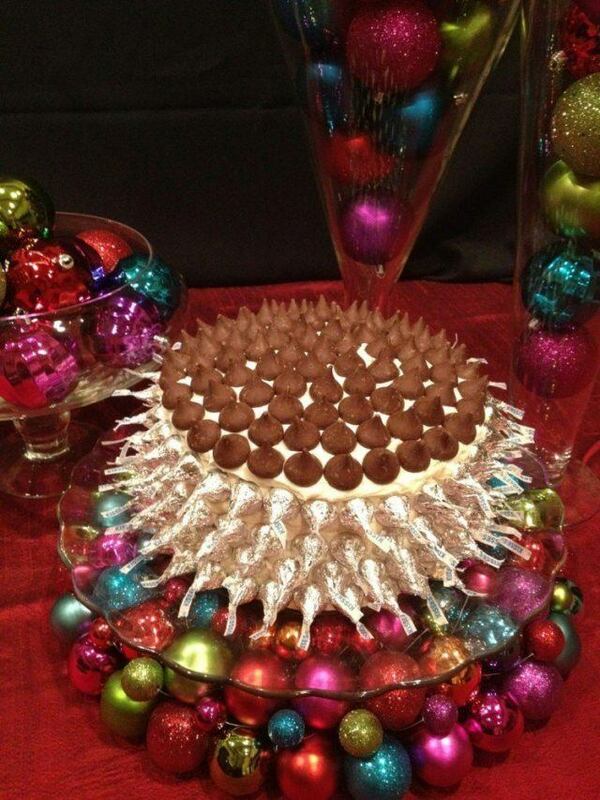 For example, we can place several baubles in a plate or a pretty font and make with them a centerpiece. 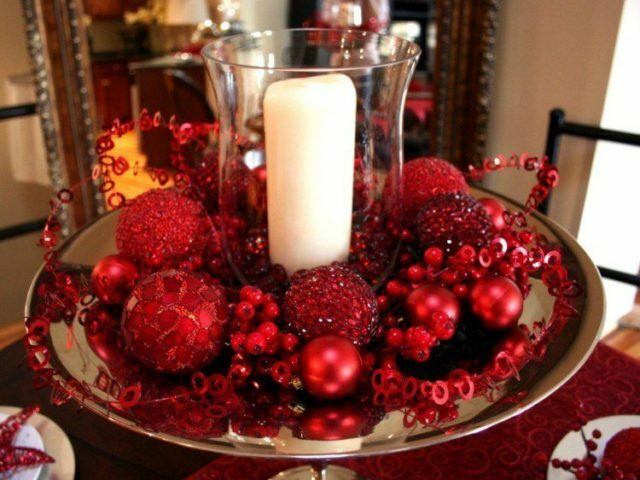 Look at this nice idea for the table decoration at Christmas, in white, red and silver. Simply get a white serving platter and place it with baubles of different shapes and sizes but in these colors we have mentioned. 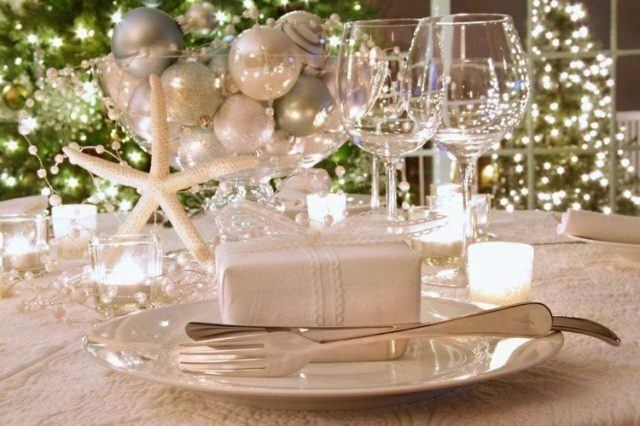 To give a more Christmasy touch, you can also put a little foam in silver, so that everything combines well. But the threads do not have to be our only choice when it comes to hanging the baubles in our house. You can also buy ribbons with more or less Christmas prints or colors that combine well with the style of decoration that we are looking for and, thus, our decorations will look much more elegant. 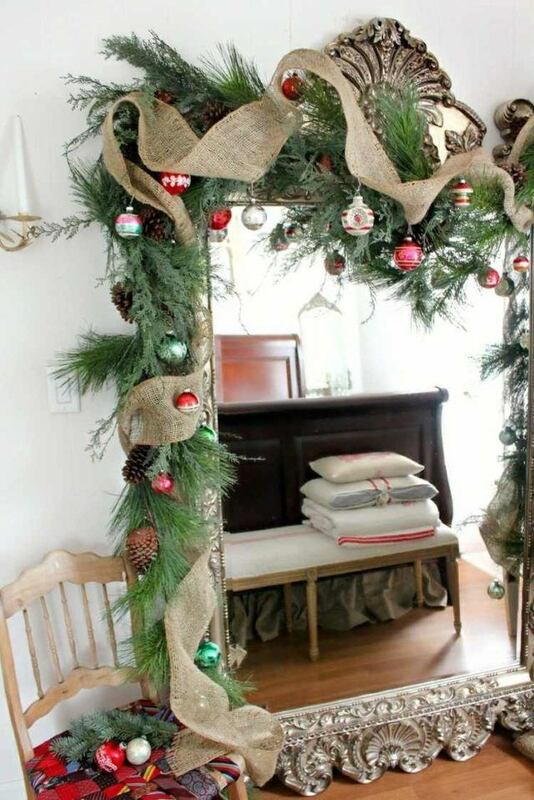 With threads we can also create our own wreaths with baubles, to decorate our Christmas tree or even to decorate other areas of the house, such as the fireplace or some hallway. They can also look great in the foyer of our home. 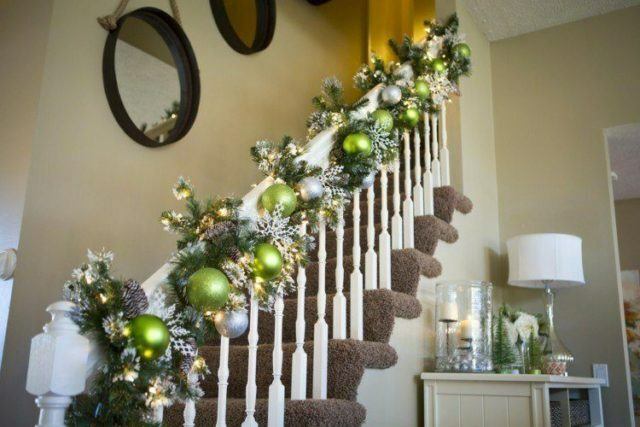 Along with other decorations, foam, some yarn, and baubles, we can create Christmas decorations for our home as beautiful as this, decorating the stairs and the central aisle of our house. With these types of ornaments, Christmas will have arrived completely to your house. 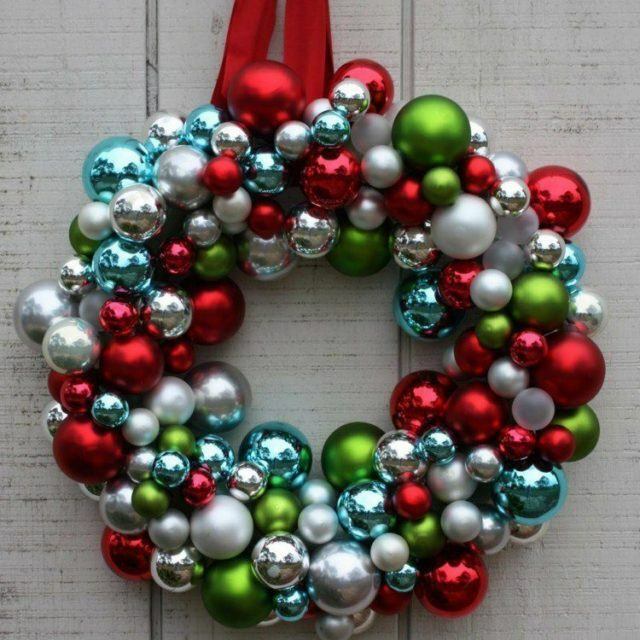 To make some baubles, we can do it with many different materials. For example, paper lined is a very nice idea, but we can also make them with flowers and cardboard. 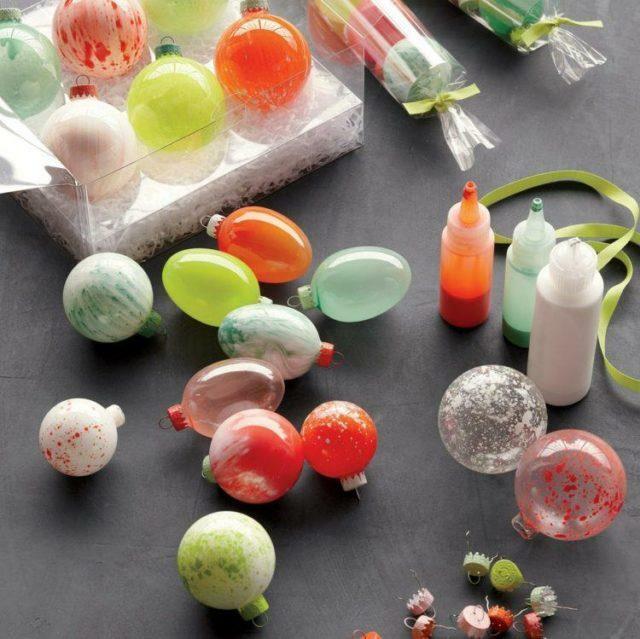 Another very original idea has to make baubles with balloons, but this is best used for specific decorations since the balloons are very easy to deflate or pinch. 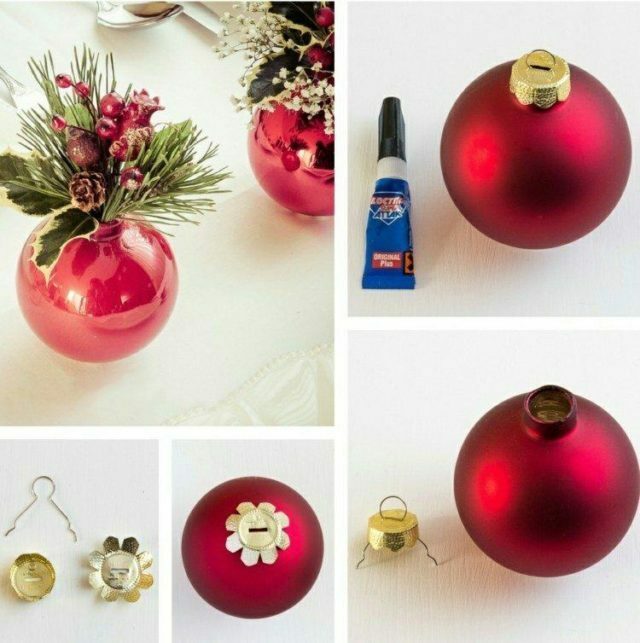 We can also make a DIY as original as this is to disarm the top of a Christmas bauble to put some flowers inside and that we have a Christmas ornament in the shape of a vase. Here at espaciohogar.com we have invested our energy in having the Christmas spirit and that is why in that time of the year we find the best Christmas decoration ideas. Something we shouldn’t be forgetting every year are the Christmas baubles. These can be in different colors or can follow the trends, like the ones we are going to show you now. Since the first Christmas baubles that were made of wood and that imitate apples, up to the latest Christmas baubles with endless designs and colors. 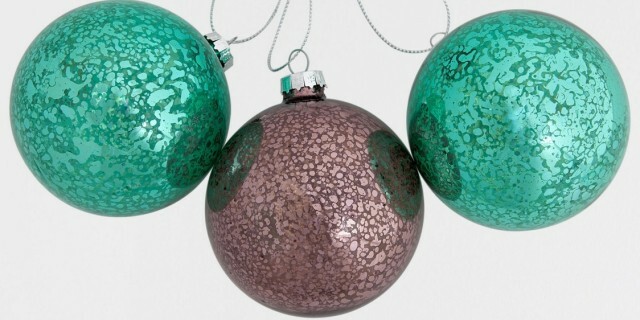 In espaciohogar.com we will help you know more about Christmas baubles. Before we begin to see which baubles are trendy, we want to talk a little bit about their origin. Apparently, the first Christmas trees were decorated with apples and strings of popcorn, candies and heart-shaped pasta or stars. 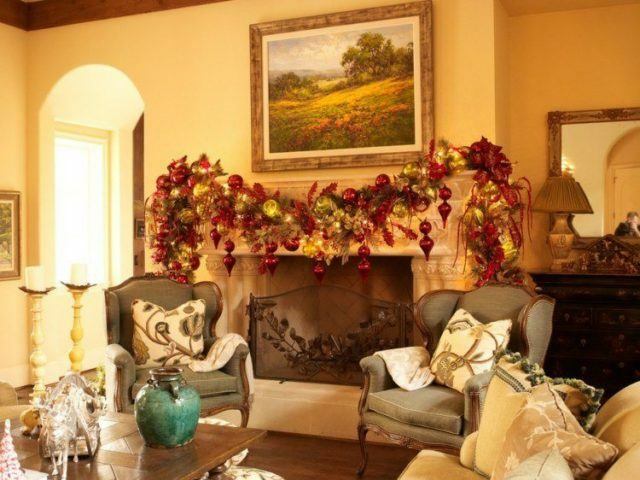 They also used holly leaves and wild fruits of red color. Wood, paper, cloth any material that was available was used to make ornaments for the tree. The early Christmas trees decorations were all about natural elements and of course the apples seemed to be the best or at least the most eye-catching. Little by little they were replaced by the baubles we know today (made in plastic or glass), but the tradition is still alive (and very much so) that red baubles are never missing in the tree perhaps in honor of those first apples that were hung in the Christmas trees of the time. In the beginning, in addition to apples, pineapples were also an element that decorated the trees, and this type of decoration has remained as such but now with artificial pineapples. Also the walnuts that were used as an ornament could be hung along with small candles that were lit every night. Hans Greiner of Lauscha Germany began to produce wreaths of glass and tin pearls imitating the chains of popcorn that were made to decorate the Christmas tree. The success was such that Hans Greiner began to expand his designs. In 1850 Justus Von Liebig developed a technique to create baubles, using silver nitrate next to the glass. The baubles were then painted by hand and a hook was attached to them to hang them. From those first baubles to the baubles of today, the baubles continue to be the main event when it comes to the Christmas decoration with multiple designs and sizes. After talking a little about the origin and tradition of baubles, we want to show you some of the trends and designs that have been launched. One of the first options we show you are the baubles in white color, which we love because they are certainly very fashionable. 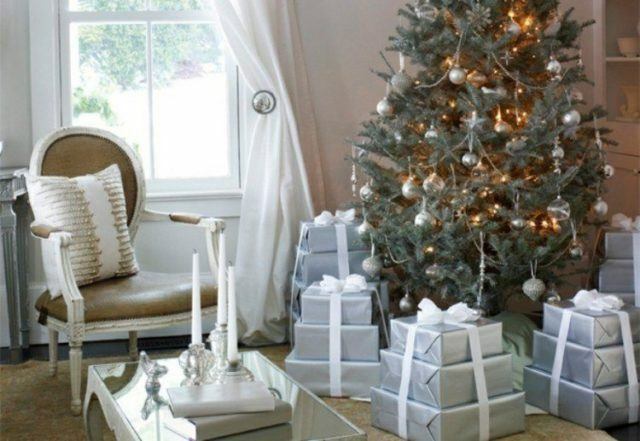 We usually buy bright colored baubles, such as gold, but given that white has been one of the main colors, firms that now release collections of Christmas decoration, like Zara Home, bet on baubles of this color, either in matt or glossy and with small details that make them stand out so much more. If you place these baubles on a lush green tree you are sure to have the most original tree of them all. 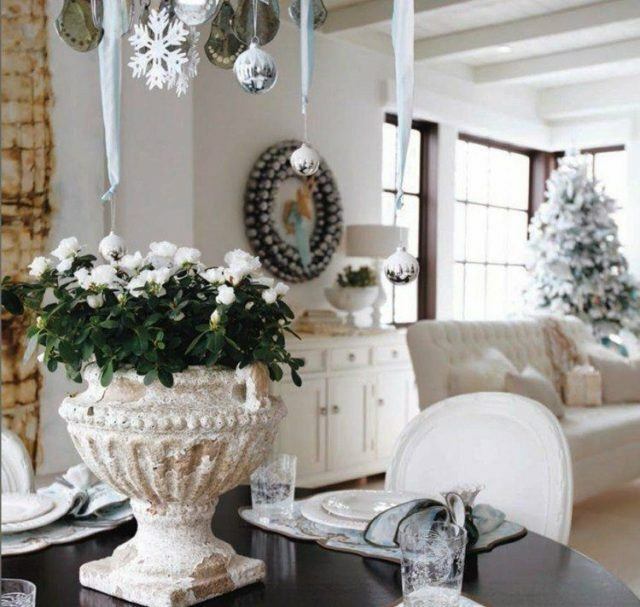 These white baubles also combine with various decorative styles such as minimalist. 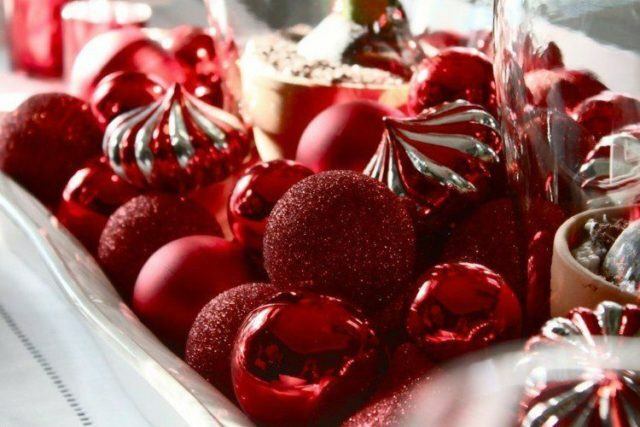 Another color that is trendy in Christmas time is red. In fact it is a frequent resort and a traditional color every Christmas, even if we do not know why. However, we just have to check which baubles are the most sold in stores like Ikea or Zara Home. You will soon find out that the red baubles are the ones that people like the most and, not only that, but it seems that we will find many different options. We have a lot to choose from so that we can decorate our tree, from plain red baubles to red baubles with details or drawings of, for instance, a reindeer. 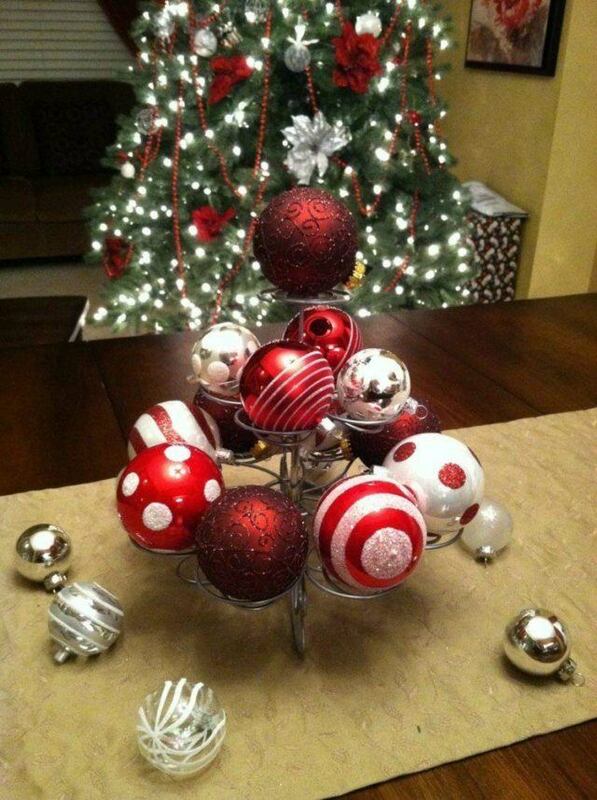 We can decorate the tree with baubles of the same color, in this case red, but at the same time were are provided variety. In the same way that the trends of this year are red and white, which are in fact colors that shouldn’t be missing in Christmas time, also for the baubles of this year we can be surprised with metallic colors, which will make your tree look very modern and also with a “retro” design, something that by the way is very trendy in current interior decoration. We have already seen several bauble trends. 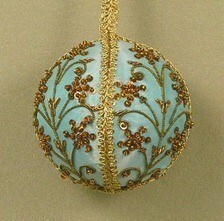 How about seeing special designs for baubles now? Many of them stand out because of their many details and, above all, for their brightness. It is the case of the baubles that you see above, baubles that imitate a jewel. In this case it is a green emerald with golden reflections and geometric design. 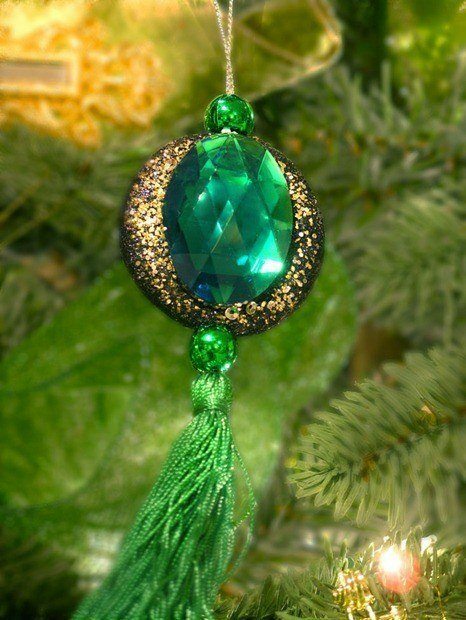 The final touch regarding this bauble with a special design is a small ornament of fringes in green color. Here we show you More baubles that imitate jewelry, with glitter and fancy touches. 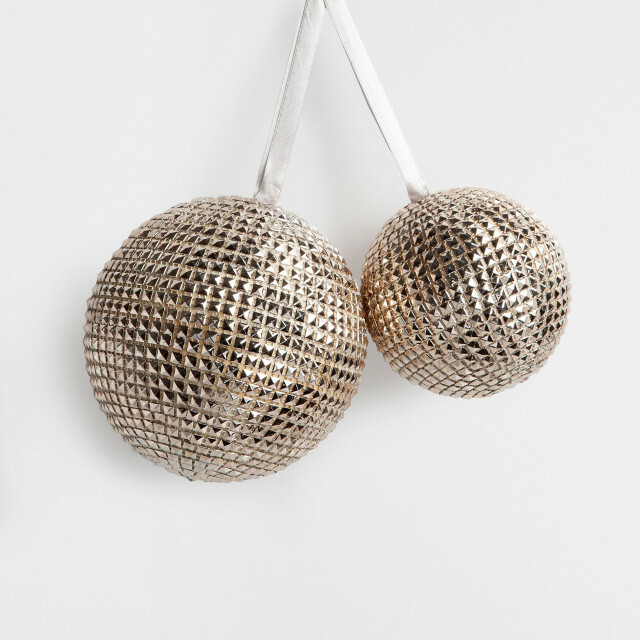 Baubles in silver color can be hung in the tree or as an ornament in a centerpiece. Sophisticated baubles with a blue background and golden trimming wall lamps. We also have the most traditional design. We can use these traditional baubles to create a beautiful ornament, next to Christmas candles, gift packages or garlands of pearl beads. There are also baubles that have a rustic style and that can be formed by small apples, which is ideal to hang as an ornament and not only in the tree. And what do you think of the bicolor white and red, modern baubles? These are quite different from the conventional ones and you even have them in different designs. 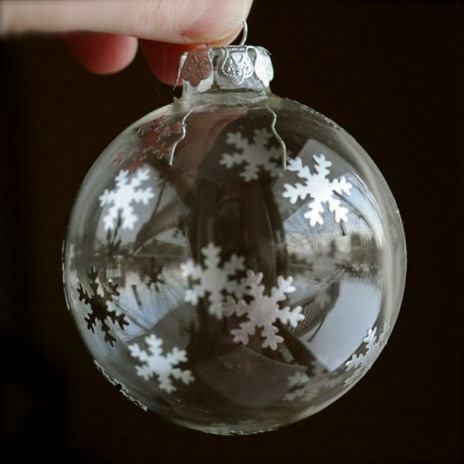 In the photo above we have a see through Christmas bauble with drawings of snow and stars. This is a frequent design but it is also a design that is always going to be a huge hit. Fun baubles like light blue baubles with red bows and funny drawings is something kids will love. They can even hang them on the Christmas tree. 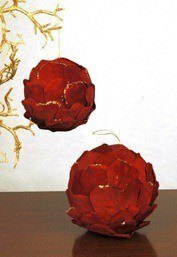 There are also design baubles that look like a rose. 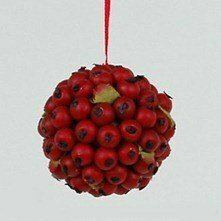 With several red baubles of this type next to apples and nuts you can make a Christmas centerpiece. 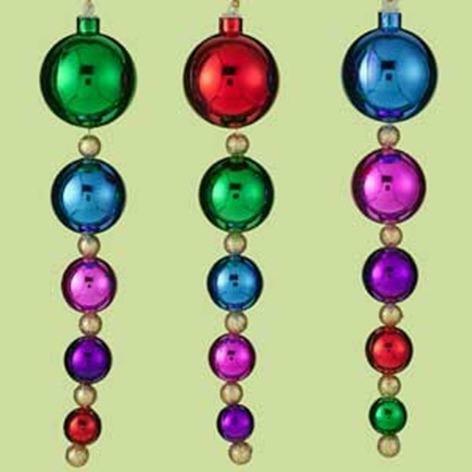 What we show you below are not baubles, but if they are ornaments you can combine them alone or with colored baubles. For instance, see through jewelery ornaments, with green or silver tint. 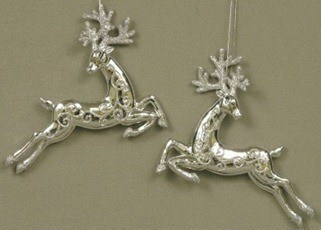 In the photos we can see some ballet dancers or some beautiful lime green earrings and silver reindeers.